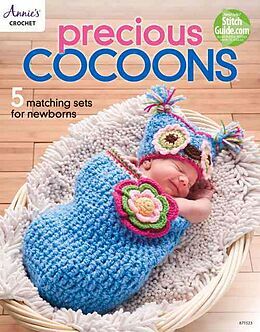 Crochet cocoons make an amazing gift and keep baby feeling safe and warm. This great collection includes 5 cocoon designs with matching hats or headband. An adorable chunky owl, a plump pumpkin, a festive Santa stocking, a cute mermaid and a sweet spiral cocoon. All are made using medium-weight yarn. Size: newborn - 3 months.